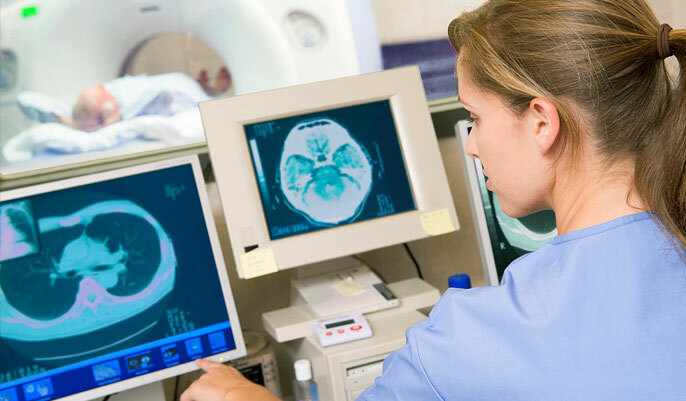 Full Body CT Scans are used to take Computer Tomographic images of the entire body and are available at our cutting-edge Los Angeles imaging facility. This can be an excellent screening tool in healthy individuals to identify any possible abnormalities (tumor, liver disease, etc…). Full body scans can be particularly helpful in patients who are at high risk for developing a particular medical condition due to their habits (smoking) or family history. Full body scans are also beneficial when testing for a specific disease or condition, such as cancer. For example, Full Body CT Scans may be used to help stage cancer so that physicians can make the best possible decisions. Full body scans are often obtained in intervals throughout the course of treatment with radiation and/or chemotherapy to assess response to these treatments. Patients need to refrain from eating and drinking for a certain time preceding the full body CT scan. Your specialists will instruct you on the particulars of this. You also may need to receive contrast dye before receiving the body scan. Contrast dye is another name for contrast media or contrast agents. These are used to improve the images produced by the full body scan, allowing radiologists to better distinguish abnormalities. Contrast materials play a key role in the effectiveness and usefulness of full body scans. The substances alter how the imaging tool interacts with the body, causing certain tissues or shapes to appear differently than they would with no contrast material. They help contrast certain areas of the body from surrounding tissues. This improves the ability to see certain tissues and blood vessels, helping our specialists diagnose medical conditions. Contrast materials can help increase visibility of the esophagus, stomach, small and large intestine, arteries and veins, brain, breast and soft tissues. They can also increase visibility of the internal organs, such as the heart, uterus, bladder, gallbladder, spleen, pancreas, kidneys, liver, lungs, heart and even the adrenal glands. Contrast materials will be given to you most likely orally (you swallowing them), or intravenously (injected into the blood vessel through an IV). Adverse reactions, such as allergies to the contrast materials, are very rare. After the procedure, the contrast materials are absorbed into the body and eventually flushed out through the body’s natural elimination process. It’s important that you inform your specialist if you have any particular allergies, if you are taking any medications or herbal supplements, if you’ve had recent surgeries or illnesses, if you have a history of heart disease, thyroid problems, hay fever, asthma, kidney disease, diabetes or sickle cell anemia. Women should inform their specialist if there is any chance they might be pregnant. These questions are in case of possible allergies to the contrast materials and to ensure it is absolutely safe for you to receive the scan. They are fairly standard questions that would be asked at a regular doctor visit. For the imaging scan, patients are positioned on a narrow table which glides into the scanner while pictures are taken. Patients need to remain motionless during imaging. CT scans are extremely fast and painless procedures. CT full body scans use X-rays to create images of the body, each showing a “slice” of the body (not unlike slices in a loaf of bread). These slices show a super thin portion of the inside of the body in detail, allowing the full body scan specialists to analyze and evaluate those images and portions of the body. The contrast materials enhance the images, making them easier to study and helping the specialists detect any problems. Receiving a full body scan in Los Angeles at our state-of-the-art facility can help diagnose and detect many medical conditions. In addition to helping detect cancers, aneurysms and risks of stroke, it is also useful in diagnosing spinal problems and injuries to the skeletal structure. This is due to its ability to show the minute details of very small bones, such as those found in the hands and feet. A full body CT scan is an invaluable tool for detecting innumerable medical conditions. It is an excellent screening tool that can diagnose conditions so they can be treated in its early stages. Our specialists are well trained at detecting and evaluating scans, allowing us to provide some of the most effective full body scans Los Angeles offers, helping you be healthier and experience a better future. The CT center at Optima Diagnostic Imaging has been awarded accreditation after a comprehensive review performed by the American College of Radiology (ACR). This certification confirms that our center meets rigorous standards for practice in CT.